I am a bookworm. I absolutely love books and could spend hours reading. My oldest daughter is just like me in that regard. She is often seen around the house with her nose buried deep in a book. We both love the feel of real books. We love our overflowing bookshelves. We love bookstores. Even so, I decided to get a Kindle. For now the Kindle is mostly for us to share, but I hope that the other kids will be able to use it as well (or maybe I’ll need another one…) Our little Kindle is the newest addition to our homeschool. 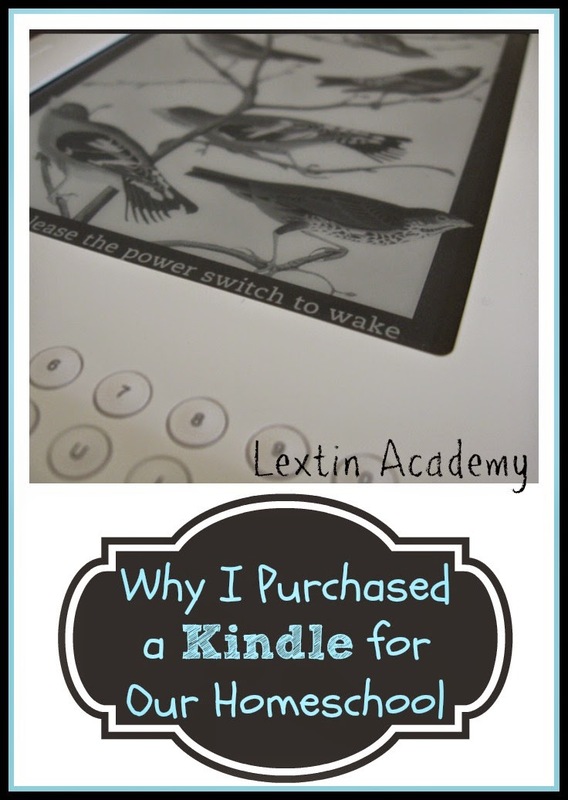 Here are a few reasons why I chose to get a Kindle and why we are enjoying it. There are so many books that I’d love to purchase, but my bookshelves simply do not have enough room. Plus, we have moved multiple times and books are very heavy to transport. The Kindle allows me to have a library of more books than would ever fit in my shelves. The Kindle allows you to borrow books from your friends, from Amazon, or from the library. I love that I don’t have to leave my house and I can have access to even more books for free. Kindle has a large selection of free books – especially classics. These are books that I want everyone in our family to read and now we can have them for free. I have the Kindle app on our iPads and our iPhones. We can read our books on various devices which makes reading very convenient. I love that I can have books to read while we are in the car or if we are on a trip. I don’t have to worry about bringing multiple books or losing books. I bring the Kindle and can have a book downloaded for each person. I love not having to wait for a book. I don’t have to be on the waiting list at the library, drive to the bookstore, or wait for a book to be delivered. I enjoy the instant gratification of having new books in a few seconds. Many Kindle books are less expensive. This means that I save money by downloading books and I don’t have to pay any shipping charges. We enjoy having more reading options on our Kindle. It doesn’t replace printed books but it does give us an opportunity to have access to more books without making countless library trips or causing our bookshelves to collapse. The Crew is on hiatus from writing reviews until January. So while we have a little time on our hands, we thought we’d bless our awesome readers with a super cool Christmas Fire Giveaway! Twenty of our team members and The Old Schoolhouse have joined together to sponsor this incredible giveaway with 3 winners! We are excited to be giving away not one, not two, but THREE Fire HD Tablets! One person will win a Fire HD 7 Tablet, and TWO people will win a Fire HD 6 Kid’s Edition (in your choice of lime green, blue or pink). Powerful, full-featured Fire HD tablet—with beautiful 7″ HD display, 2x faster quad-core processer, dual speakers with Dolby Audio, and unsurpassed reliability in its class. Only Passionate Curiosity I Choose Joy! Homeschool Encouragement Ben and Me The Potter’s Hand Academy As We Walk Along the Road Adventures with Jude A Mama’s Story futureflyingsaucers Kathys Cluttered Mind Footprints in the Butter Crystal Starr Lextin Academy Living Life and Learning My Harbor Lights Our Homeschool Studio Pea of Sweetness Embracing Destiny Be The One Simple Living Mama Our team of bloggers will be sharing about how tablets can be used in homeschooling, and linking up their posts her for you to learn more.